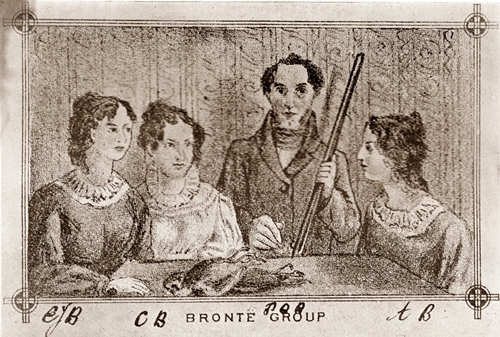 Branwell Brontë died on 29th September 1849, the first in a tragic sequence that would also see his sisters Emily and Anne die within a nine month period. In the months and years leading up to his death he had become a pathetic figure, addicted to drink and to opium, begging for money to obtain his next ‘hit’ and frequently in demand from debt collectors. In a later blog we shall look into why this happened, and see how he became a real danger to himself and his family. If this image of Branwell as being mad, bad and dangerous to know was certainly true by 1849, we should also remember that to the young Anne Brontë he was often a kind and loving brother. Patrick Brontë, as he was christened, was born in the Bradford village of Thornton on June 26th 1817, a year after his sister Charlotte. He would forever be known as Branwell, his middle name and the maiden name of his mother Maria, to avoid confusion with his father Patrick. A year after Branwell’s birth, Emily was born, and then a year and a half later came the last of the six Brontë children, Anne. That never more may wake again. From an early age Branwell felt a pressure on his shoulders. He was the only boy in the family, he would be expected to become a practical man, a breadwinner. His adult life was to show it was a role to which he was singularly unsuited. In his childhood he formed a close bond with his three surviving sisters. It was his toy soldiers that started the tales of the ‘twelve men’. They would all four gather and invent stories that are incredibly complex for young children. He and Charlotte would eventually start to write them down in incredibly tiny books that they would stitch together, the famous and priceless books that have writing so small it can only be read with a magnifying glass. The young Anne, always the doted upon baby of the family, would look up to her brother with a kind of awe. It was he would lead his sisters on their early excursions across the moors, proudly taking the lead as the ‘man’ of the family. He would sit Anne on his knee and tell her stories, and as they both grew a little older he would draw pictures for her. 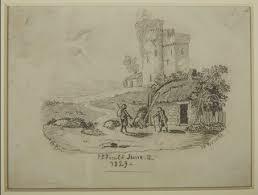 Always a talented artist, he would draw fairytale castles, and gentle countryside scenes and he would inscribe them ‘for Anne’. To bless the sinner’s woe. Anne, remembering the kind brother who drew her pictures to brighten up the days, would also secure him employment with the Robinson family for whom she worked as a governess. It was this that would lead to Branwell’s tragic end, as we shall see in a later blog, and Anne would carry a feeling of guilt around with her because of it. It was she, she would tell herself, who had brought about the demise of the brother who had once loved her so, and who she always loved.